Find events happening in the southwest area and around the Las Vegas Valley. 1. Speed Dating: Divine Events is set to host an all-ages speed dating event from 5 to 6:30 p.m. July 28 in the Divine Cafe at the Springs Preserve, 333 Valley View Blvd. Admission is $15, which includes one drink ticket. Visit tinyurl.com/flashdatelv. 2. 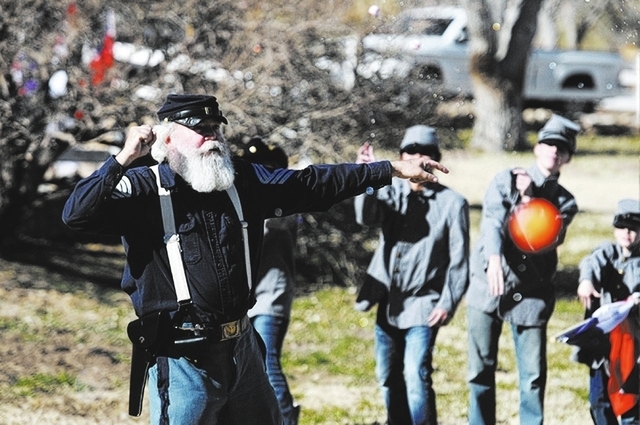 Civil War experience: Guests can try on Civil War uniforms and learn to march and drill in formation with input from historic re-enactments at 10 a.m. July 30 at Spring Mountain Ranch State Park, 6375 state Route 159, about 10 miles west of the 215 Beltway. Park admission is $7 per car for Nevada residents. Visit parks.nv.gov/parks/spring-mountain-ranch-state-park. 3. Harry Potter Birthday Bash: Children are invited to celebrate the book character’s birthday with crafts and fun from 3 to 4 p.m. July 29 at the Windmill Library, 7060 W. Windmill Lane. Visit lvccld.org. Walk Off Hits: The four-person band is set to put on a free show at 10 p.m. July 28 in The Lounge at the Palms, 4321 W. Flamingo Road. Visit palms.com. Rhythm Nation: The band is set to play at 9 p.m. July 28-30 in the Bourbon Street Cabaret Lounge at The Orleans, 4500 W. Tropicana Ave. Admission is free. Visit orleanscasino.com. Art reception: An opening for Julian Eusebio’s “Art Expression in Color and Charcoal” exhibit is scheduled from 5 to 6:30 p.m. July 28 at the Windmill Library, 7060 W. Windmill Lane. The exhibit is set to be on display through Sept. 20. Visit lvccld.org. Garage Sale: Connor and Millie’s Dog Rescue plans a garage sale fundraiser at 8 a.m. July 30 at 3592 Australian Cloud Drive. The rescue focuses on dogs with medical issues needing forever homes. Visit connorandmilliesdogrescue.org. Paul Charles Campanella: The drummer-turned-front man is set to put on a free show at 10 p.m. July 29 in The Lounge at the Palms, 4321 W. Flamingo Road. Visit palms.com. Latinos All-Stars: Performances are scheduled at 10:30 p.m. July 30 and Aug. 13 and 27 in the showroom lounge at the Gold Coast, 4000 W. Flamingo Road. Admission is $10. Visit goldcoastcasino.com. Kids’ games: Kids ages 6 to 11 are invited to play with Lego bricks, video games and board games from 4 to 5 p.m. July 29 at the Spring Valley Library, 4280 S. Jones Blvd. Visit lvccld.org. San Fernando Band: The group is set to play at 9 p.m. July 29 and Aug. 5 and 7 at the Gold Coast, 4000 W. Flamingo Road. Admission is $10. Visit goldcoastcasino.com. Midnight movies: Midnight movies are set to launch with a screening of the horror thriller “A Bay of Blood” at 11:59 p.m. July 30 at The Sci Fi Center, 5077 Arville St. Admission is $5. Visit thescificenter.com. Peter Pan prequel: Performances of “Peter and the Star Catcher,” a play by Rick Elice based on the novel by Dave Barry and Ridley Pearson, are scheduled at 8 p.m. July 28-30 and 2 p.m. July 31 at the Las Vegas Little Theatre, 3920 Schiff Drive. Tickets are $25. Visit lvlt.org. Water on the Meadow: Rangers and volunteers are set to roll out the slip n’ slide for water play in the meadow from 1 to 3 p.m. July 30 and Aug. 7, 21 and 27 at Spring Mountain Ranch State Park, 6375 state Route 159. Swim suites are suggested as are baby shampoo donations to help make the slide slippery. Entry to the park is $7 for Nevada residents. Call 702-875-4141 or email smr-interp@parks.nv.gov. Odd Squad: Children ages 5 to 8 are invited to become Odd Squad agents using math and problem solving skills from 11:30 a.m. to 12:30 p.m. July 29 at the Spring Valley Library, 4280 S. Jones Blvd. Registration is required. Visit lvccld.org. Puppet show: Toy and Roy are set to star in a fractured fairy tale from 3 to 3:45 p.m. July 30 at the West Charleston Library, 6301 W. Charleston Blvd. Visit lvccld.org. Trace Adkins: The country music star is scheduled to perform at 8 p.m. July 30 and 31 in the showroom at The Orleans, 4500 W. Tropicana Ave. Tickets start at $69.95. Visit orleanscasino.com. Unstuck Conference: The event is planned from 9 a.m. to 5 p.m. July 30 at The Orleans, 4500 W. Tropicana Ave., and is scheduled to feature speakers who have faced everything from cancer to the loss of a child, including John Polish, Jeff Bearden, World Champion of Speaking winner Darren Lacroix, Dustin Shillcox, Dale Krause, Ronda Taylor, Frank Curreri, Sheryl Green and Monica Von. Tickets are $10 to $59. Visit tinyurl.com/zom4otq. Sin City Sinners: A free show is slated for 10:30 p.m. July 30 in The Lounge at the Palms, 4321 W. Flamingo Road. Visit palms.com. Summer Prom: Children 11 or younger are encouraged to dress up and enjoy stories, activities and dancing from 4 to 5 p.m. July 31 at the Spring Valley Library, 4280 S. Jones Blvd. Visit lvccld.org. Lounge shows: The band 360 is set to perform at 9 p.m. Aug. 4-6 and 25-27 in the Bourbon Street Cabaret Lounge at The Orleans, 4500 W. Tropicana Ave. Admission is free. The band is also set to perform at 9 p.m. Aug. 19 and 21 in the showroom lounge at the Gold Coast, 4000 W. Flamingo Road. Admission is $10. Visit goldcoastcasino.com. Painting parties: Ongoing themed painting classes are scheduled at The Bubblegum Gallery, 1800 S. Industrial Road, Suite 207D, from 6 to 8 p.m. Most classes are $20. Find LeslieAnn Farrell on Facebook or call 702-806-0930. NiteKings: The band is set to play at 4 p.m. Aug. 3, 1o, 17, 24 and 31 in the Bourbon Street Cabaret Lounge at The Orleans, 4500 W. Tropicana Ave. Admission is free. Visit orleanscasino.com. Yoga on the Meadow: Yoga sessions are planned weekends in the meadow at Spring Mountain Ranch State Park, 6375 state Route 159, about 10 miles west of the 215 Beltway. Entry into the park is $7 per vehicle for Nevada residents and $9 per vehicle for others. For times, contact David Low at 702-875-4141 or smr-interp@parks.nv.gov. Cabanas for a Cause: The Palms, 4321 W. Flamingo Road, has set aside select Mondays throughout the summer to donate a $100 per cabana rental fee to a different charity every week. The lineup includes Dress for Success Southern Nevada on Aug. 8; the Epicurean Charitable Foundation on Aug. 15; Firefighters of Southern Nevada Burn Foundation and the Las Vegas Boxer Club and Rescue on Aug. 22; and Special Olympics Nevada on Aug. 29. Visit palms.com. “Desert Survivor!”: A new animal show is set to feature a rotating cast of critters including the desert night snake, desert tortoise, kangaroo rat, California kingsnake, desert tarantula, gopher snake, chuckwalla and more in 30-minute shows at 11 a.m. and 1 p.m. daily through Aug. 21 inside the Big Springs Theatre in the Origen Museum at the Springs Preserve, 333 S. Valley View Blvd. Shows are free with paid admission. Visit springspreserve.org. Playing with Light: Guests can use basic physics principals to explore interactive exhibits at a visiting exhibit on the art of illumination through Sept. 4 in the Origen Museum at the Springs Preserve, 333 S. Valley View Blvd. Guests can sneak past a laser light security block, step inside a giant telescope and draw with infrared paint. The exhibit is free with paid admission. Visit springspreserve.org. Class registration: Registration is under way for the fall session, set to begin Sept. 7, at the Charleston Heights Arts Center, 800 S. Brush St. Classes are planned for children, teens and adults in visual arts, dance, drama and more. Visit artslasvegas.org or call 702-229-6383. Polage art: The work of local artist Austine Wood Comarow featuring polarized filters and light is set to be on display through Sept. 18 in the Big Springs Gallery in the Origen Museum at the Springs Preserve, 333 S. Valley View Blvd. Visit springspreserve.org. “Heritage Habitats”: Ginger Owen and Vicki Vanameyden’s art exhibit focused on nostalgia and memory is set to be on display through Oct. 1 at the Charleston Heights Arts Center, 800 S. Brush St. Visit artslasvegas.org. Night and guided hikes: A free night hike is planned from 8 to 9 p.m. July 29 at the Spring Mountains Visitor Gateway, 2525 Kyle Canyon Road. It is rated easy with mostly paved paths and gravel over small hills. Participants are invited to bring a flashlight. A free guided hike is planned from 2 to 4 p.m. July 31 at the Gateway, with an interpretive naturalist set to lead small groups on an easy-to-moderate trail, sharing information about the trail, flora and fauna and the Spring Mountains. Space is limited for both hikes, and registration is required. Visit gomtcharleston.com or email programs@gomtcharleston.com. Bowl 4 The Kids: The annual fundraiser for the Cure 4 The Kids Foundation’s Charity Care Program is planned for July 30 at the Strike Zone Bowling Center at Sunset Station, 1301 W. Sunset Road. Bowlers get three games, a commemorative T-shirt, pizza and other treats, and special activities are planned for kids including face-painting, balloon animals by Tawney Bubbles and roving characters, along with a raffle, silent auction and bake sale. Registration is $25 and includes three games. Contact Becky Stephenson at 702-691-5716 or email bstephenson@cure4thekids.org, or register online at tinyurl.com/jk87p3y. Camping at Craig Ranch Regional Park: The free event is planned from 7 p.m. July 29 to 7 a.m. July 30 at Craig Ranch Regional Park, 628 W. Craig Road. North Las Vegas residents, Boy and Girl Scout troops, city officials and city fire and police departments are invited to participate. Food will be available for dinner and breakfast in the morning. Free activities including a movie, kickball and a bike-riding excursion are planned. Visit cityofnorthlasvegas.com. Painted Stories Duel in The Library: The event is scheduled at 2 p.m. July 31 at the Clark County Library, 1401 E. Flamingo Road. It is a mixed media showcase of two local authors and two local artists on one stage. In two dueling sessions, as each author reads from his/her work, both artists will turn blank canvas into works of art live in front of the audience. Visit lvccld.org or call 702-507-3400. “Sharknado — The 4th Awakens” Cast Party With a Cause: The event is scheduled from 8 to 11 p.m. July 31 at Elation Pool at the Stratosphere, 2000 Las Vegas Blvd. South. Fans are set to have the opportunity to take photos with the movie’s actors, including Ian Ziering, Tara Reid, Gary Busey and more at the official after-party benefiting The Animal Foundation. Participants may also swim and view the film. Tickets are $15. Visit stratospherehotel.com or call 702-380-7777. “Mr. Mark Twain Answers All Your Questions!”: Performances are scheduled for 8 p.m. July 29 and 30 and 2 p.m. July 31 at the Onyx Theatre, 953 E. Sahara Ave., No. 16B. Part one-man improv and part self-help session, the show has audience members submit “Questions” and “Truths” on index cards as they enter the theater. Through the course of the one-hour production, Twain will hit on all submissions, as well as addressing the crucial need or lack thereof of the One Person Show. Tickets are $20 and $15 for students, seniors and military personnel (and nerds, per Onyx). Visit onyxtheatre.com or purchase tickets at the box office one hour before performances. Meet-and-greets with “Pawn Stars”: The events are scheduled from 1 to 3 p.m. Thursdays at the Gold & Silver Pawn Shop, 713 Las Vegas Blvd. South. Meet-and-greets featuring security guard Antwaun are scheduled from 11 a.m. to noon Saturdays and ones featuring historian Mark Hall-Patton are scheduled from 12:30 to 1:30 p.m. Saturdays and Sundays. Admission is free, but Gold & Silver Pawn is accepting donations for a variety of charities throughout the summer on Thursdays, including Grant A Gift for Autism July 28 and the Shine Family Foundation (for veterans) Aug. 4. Visit gspawn.com or call 702-385-7912. Red Rock Canyon children’s program: The Red Rock Canyon Interpretive Association is putting together a season-long children’s program series focused on the natural history of Red Rock Canyon called The Canyon Club. On select Tuesdays throughout the summer, children 6 to 8 are invited to explore topics with hands-on activities, games and crafts. Programs start in the morning and last for roughly 90 minutes. Dates include Aug. 2, 9 and 16. Registration is required (participants can sign up for multiple dates). Visit RedRockCanyonLV.org or call 702-515-5367. “The Sound of Music”: Performances by the national touring production are scheduled at 7:30 p.m. Aug. 2-14 and 2 p.m. Aug. 6, 7, 13 and 14 at The Smith Center for the Performing Arts, 361 Symphony Park Ave. Tickets are $36 to $127. Visit thesmithcenter.com or call 702-749-2012. Hot yoga in the Neon Boneyard: The Neon Museum plans to offer one-hour hot yoga sessions with certified instructor Eileen Lorraine in its outdoor Neon Boneyard, 770 Las Vegas Blvd. North, at 5:30 p.m. Aug. 3, 17 and 31. The class is appropriate for beginners to advanced yogis 18 or older (children must be accompanied by an adult guardian) and will consist of flowing vinyasa sessions set to vintage Las Vegas-inspired beats. Sessions are $18 for the public and $13 for museum members; neonmuseum.org/happenings or 702-387-6366. The History of Burlesque in Las Vegas: The event, part of the Las Vegas Stories Series, is scheduled from 4 to 7 p.m. Aug. 4 at the Clark County Library, 1401 E. Flamingo Road. As the Burlesque Hall of Fame gets ready to move into its new museum in the Las Vegas Arts District, Executive Director Dustin Wax plans to discuss the history of burlesque in Las Vegas from Harold Minsky’s first revues at the Dunes and Lili St. Cyr’s residency at the El Rancho through the glamour years of the ‘70s. Visit lvccld.org or call 702-507-3400. Hot Havana Nights: The event is scheduled from 6 to 10 p.m. Aug. 4 at the Mob Museum, 300 E. Stewart Ave. The celebration of Cuban culture is set to in­clude Cuban cuisine, tropical cocktails, music, dancing, casino-style games, hand-rolled Mob Museum-label premium cigars by Spirit of Cuba and more. Tickets are $69 for general admission with a 10 percent discount for museum members. Visit themobmuseum.org or call 702-229-2734. Fly in Zero Gravity with George Takei: As part of the Star Trek 50th anniversary celebration, ZERO-G And Roddenberry Adventures are offering a zero gravity simulation flight Aug. 4 with actor George Takei, known for his role as Sulu in “Star Trek” and several films. Takei and others are set to board G-Force One, ZERO-G’s specially modified Boeing 727 that uses parabolic arcs to achieve weightlessness for 30 seconds at a time. Each ticket is $6,500 plus a 5 percent tax and will include a ZERO-G flight suit, Regravitation Celebration, certificate of weightless completion, and photos and video. Visit gozerog.com. Martin Kreloff/A Retrospective”: The free exhibit is set to be on display during regular library hours through Aug. 6 in The Studio at the Sahara West Library, 9600 W. Sahara Ave., featuring pop art-influenced paintings, drawings and new media works. Experience Kreloff’s 50-year journey as an artist and the many celebrities he’s met and painted. Call 702-507-6222. Cancer fundraiser kickoff: The Making Strides of Las Vegas Kickoff is set for 7 a.m. Aug. 10 at Red Rock Resort, 11011 W. Charleston Blvd. RSVP by Aug. 1. Call 702-891-9008. The Making Strides Against Breast Cancer event is scheduled for Oct. 30 at Red Rock Resort. Registration is set for 7:30 a.m., and the start time is 8:30 a.m. Visit makingstrideswalk.org/lasvegasnv. “A Visual Language”: The exhibit by artist Eric Vozzola is set to be on display through Aug. 19 at the Winchester Cultural Center’s gallery, 3130 McLeod Drive. It consists of paintings large and small, including works on found materials, canvas and painted installations that activate the gallery space in multiple layers. Call 702-455-7340 or visit clarkcountynv.gov/parks. “All About Clay”: The exhibit by the Nevada Clay Guild is set to be on display during regular library hours through Aug. 21 at the Summerlin Library, 1771 Inner Circle Drive, showing stoneware and porcelain works by guild members. Visit lvccld.org or call 702-507-3860. Super Toy Con: The diecast model car, toy, comic and pop culture convention is set from 4 to 10 p.m. Aug. 5, 10 a.m. to 9 p.m. Aug. 6 and 10 a.m. to 5 p.m. Aug. 7 in the Orleans Arena, 4500 W. Tropicana Ave. Celebrity guests are scheduled to include Chris Sarandon, the voice of Jack Skellington; David Anders from the television series “iZombie”; Milo Ventimiglia from the television series “Heroes;” David Prowse, who played Darth Vader; and William Zabka from the 1984 film “The Karate Kid.” Single-day tickets start at $12. Visit orleansarena.com or call 702-284-7777. Latin Breeze: A performance is scheduled at 10:30 p.m. Aug. 6 and 20 in the showroom lounge at the Gold Coast, 4000 W. Flamingo Road. Admission is $10. Visit goldcoastcasino.com. Pop Strings Orchestra: The 15-piece band is slated to perform free at 11 p.m. Aug. 6 and 20 in The Lounge at the Palms, 4321 W. Flamingo Road. Visit palms.com. Jukebox Heroes: The band is set to play at 9 p.m. Aug. 11-13 in the Bourbon Street Cabaret Lounge at The Orleans, 4500 W. Tropicana Ave. Admission is free. Visit orleanscasino.com. Back-to-School Supplies Block Party: Kotton Kandy, aka Dwayne Dukes, and Pure Energy Productions plan a block party with school supplies from 9 a.m. to 2 p.m. Aug. 13 at 4624 Drake Circle. Call 702-624-2850. “Bring It On”: Super Summer Theatre performances of the cheerleading musical are scheduled under the stars at 8:05 p.m. Aug. 10-13, 17-20 and 24-27 at Spring Mountain Ranch State Park, 6375 state Route 159, about 10 miles west of the 215 Beltway. Tickets are $12.95 in advance for Wednesdays and Thursdays and $15.95 for Fridays and Saturdays and $20 at the gate if available. Children 5 or younger get in free. Visit supersummertheatre.org. Tribute show: Dylan and Zachary Zmed are set to present “The Bird Dogs: The Everly Brothers Experience,” a tribute show, at 8 p.m. Aug. 12 and 13 at The Orleans, 4500 W. Tropicana Ave. Tickets start at $19.95. Visit orleanscasino.com. Matt Schofield: The British Blues Hall of Fame inductee is set to perform in a free show at 10 p.m. Aug. 13 in The Lounge at the Palms, 4321 W. Flamingo Road. Visit palms.com. Walk With a Doc: Take a free educational stroll with University Medical Center physicians at 8 a.m. the third Thursday of most months at the Springs Preserve, 333 S. Valley View Blvd. Upcoming topics include: Saving your Sight on Aug. 18; Ovarian & Prostate Cancer Awareness on Sept. 15; Breast Cancer Awareness on Oct. 20; Respiratory & Lung Health on Nov. 17; and Managing Stress & Dealing with Depression on Dec. 15. Visit springspreserve.org. Coin, stamp shows: The Las Vegas Coin, Currency, Jewelry, Postcard & Stamp Shows are planned from 11 a.m. to 6 p.m. Fridays, 10 a.m. to 5 p.m. Saturdays and 10 a.m. to 5 p.m. Sundays, Aug. 19-21, Oct. 14-16 and Dec. 2-4, at The Orleans, 4500 W. Tropicana Ave. Contact Israel I. Bick at 866-226-0507 or iibick@sbcglobal.net. Jackson Browne: The singer/songwriter plans to perform at 8 p.m. Aug. 20 at The Pearl inside the Palms, 4321 W. Flamingo Road. Tickets start at $66. Visit palms.com. Rainbow Company auditions: Serious theater students ages 10 to 17 are invited to audition for the Rainbow Company Youth Theatre Student Ensemble at 1 p.m. Aug. 20 at the Charleston Heights Arts Center, 800 S. Brush St. There is no charge to audition, but those accepted pay a $50 annual fee. The ensemble meets evenings and weekends during the school year and works onstage and backstage. Visit artslasvegas.org. Yu-Gi-Oh! : Youths in grades 4-12 can bring a deck to play in the tournament scheduled from 3:30 to 5 p.m. Aug. 20 at the Spring Valley Library, 4280 S. Jones Blvd. No buying, selling or playing for cards is permitted. Visit lvccld.org. Culture Club: The band plans to perform at 8 p.m. Aug. 21 at The Pearl in the Palms, 4321 W. Flamingo Road. Tickets start at $70. Visit palms.com. Summer-end bash: A picnic-themed party with lunch, entertainment and raffle prizes is planned for seniors from 11:30 a.m. to 1:30 p.m. Aug. 24 at the West Flamingo Active Adult Center, 6255 W. Flamingo Road. The cost is $5. Registration begins Aug. 4. Visit clarkcountynv.gov. Psychic performance: Psychic Gary Spivey plans to put on a show at 8 p.m. Aug. 27 in The Lounge at the Palms, 4321 W. Flamingo Road. Tickets start at $27. Visit palms.com. Family History Jamboree: The 14th annual event is set to be packed with classes for beginning and advanced genealogists from 8 a.m. to 12:30 p.m. Aug. 27 at the 221 S. Lorenzi Blvd. Church of Jesus Christ of Latter-day Saints chapel. Ron Tanner from Family Search is scheduled to keynote. Admission is free. Visit lvstakefamilyhistoryjamboree.org. Rainbow Company Youth Theatre: The theater group plans to offer an Adventures in Acting class for children 7 to 10 from 2:15 to 3:15 p.m. Saturdays, Aug. 27-Sept. 24, at the Charleston Heights Arts Center, 800 S. Brush St. The class fee is $29. Acting for Teens, a class for performers 13 to 18, is planned from 7 to 8:30 p.m. Wednesdays, Aug. 24-28. The class fee is $60. Registration is underway. Visit artslasvegas.org or call 702-229-6383. Saturday of Service: Volunteers are needed to help spruce up Opportunity Village in anticipation of fall events. Saturday of Service events are scheduled from 8 a.m. to noon throughout August and September at the 6300 W. Oakey Blvd. campus. Visit opportunityvillage.org or contact Krysti Gabriel at 702-880-4068 or gabrielk@opportunityvillage.org. USA Dance: The local branch of the national nonprofit plans to host all-ages ballroom dances featuring a variety of music styles from 7:30 to 10:30 p.m. Aug. 27 and Sept. 10 at the Charleston Heights Arts Center, 800 S. Brush St. Most events include a lesson and some feature exhibition dancing from experts. Admission is $10 for adults and $5 for USA Dance members, students and military members. Pay at the door. Visit usadancelasvegas.com. Contemporary country: “Ghostlight,” a show featuring contemporary country music, is scheduled from 7:30 to 9 p.m. Aug. 28 in the Sammy Davis Jr. Festival Plaza, 720 Twin Lakes Drive. Admission is free. Bring blankets or lawn chairs for outdoor seating. Wine and refreshments will be available for purchase. Visit artslasvegas.org. “The Mystery of Edwin Drood”: Super Summer Theatre performances of the play are scheduled under the stars at 7:05 p.m. Sept. 8-10, 15-17 and 22-24 at Spring Mountain Ranch State Park, 6375 state Route 159, about 10 miles west of the 215 Beltway. Tickets are $12.95 in advance for Thursdays and $15.95 for Fridays and Saturdays and $20 at the gate if available. Children 5 or younger get in free. Visit supersummertheatre.org. Outcry Summer 2016 Tour: The religious music groups Hillsong Worship, Kari Jobe, Bethel Music and more are slated to perform at 6:30 p.m. Aug. 26 in the Orleans Arena, 4500 W. Tropicana Ave. Tickets start at $29.95. Visit orleansarena.com. Make America Rock Again Tour: A hard rock band lineup including Trapt, Saliva, Saving Abel, Alien Ant Farm, Crazytown, 12 Stones and Tantric is scheduled to take the stage at 7:30 p.m. Sept. 2 at the Orleans Arena, 4500 W. Tropicana Ave. Tickets start at $15. Visit orleansarena.com. Stars Over the Valley: The Las Vegas Quilters’ annual quilt show is scheduled from 10 a.m. to 5 p.m. Sept. 9 and 10 and 10 a.m. to 3 p.m. Sept. 11 at the Springs Preserve, 333 S. Valley View Blvd. Visit lasvegasquilters.com. Greek Food Festival: The 44th annual Las Vegas Greek Food Festival is scheduled from 3 to 11 p.m. Sept. 16, from noon to 11 p.m. Sept. 17 and from noon to 10 p.m. Sept. 18 at St. John the Baptist Greek Orthodox Church, 5300 S. El Camino Road. The annual event includes music, dancing, greek food, a carnival and tours of the Byzantine church. Admission is $6 for adults and free for children 12 or younger and for active military members and their immediate family. For a full schedule and parking information, visit lasvegasgreekfestival.com. Festival of Praise: The tour is set to feature Grammy Award-winning artists Fred Hammond, Israel Houghton, Regina Belle and Karen Clark Sheard, as well as industry favorites such as Hezekiah Walker at 7 p.m. Oct. 5 in the Orleans Arena, 4500 W. Tropicana Ave. Tickets start at $35. Visit orleansarena.com. Creature features: The cult classic films “The Brain from Outer Space” and “The Brain That Wouldn’t Die” are slated to be screened from 6:30 to 9 p.m. Oct. 29 in the Sammy Davis Jr. Festival Plaza, 720 Twin Lakes Drive. Admission is free. Bring lawn chairs or blankets for lawn seating. Refreshments will be available for purchase. Visit artslasvegas.org or call 702-229-3514. Il Divo: The classical crossover group is set to perform at 8 p.m. Nov. 18 at The Pearl inside the Palms, 4321 W. Flamingo Road. Tickets start at $74 and are on sale now. Visit palms.com. Yes: Jon Anderson, Trevor Rabin and Rick Wakeman plan to reunite for a show scheduled at 8 p.m. Nov. 19 in The Pearl at the Palms, 4321 W. Flamingo Road. Tickets start at $50. Visit palms.com. Stroke support: A stroke survivor support group is scheduled to meet from 11 a.m. to 12:30 p.m. the third Friday of each month at Spring Valley Hospital, 5400 S. Rainbow Blvd. Lunch is provided. Register at 702-853-3162. Guitar for amateurs: Local instructor Don Musser is set to give a free entry-level group lesson for teens, adults and seniors from 4 to 5 p.m. most Sundays at the Spring Valley Library, 4280 S. Jones Blvd. Visit lvccld.org. “Aurora”: The Film “Aurora: Fire in the Sky” is set to be screened at 3 p.m. Saturdays and Sundays in July in the Big Springs Theater in the Origen Museum at the Springs Preserve, 333 S. Valley View Blvd. Visit springspreserve.org. Summer fun camps: Themed camps for kids ages 6 to 12 are scheduled from 9 a.m. to 4 p.m. Mondays through Fridays through Aug. 26 at the Springs Preserve, 333 S. Valley View Blvd. Camp fees are $200 per week for Springs Preserve members and $225 for nonmembers. After-hours care is available for an additional $50 per week. Visit springspreserve.org. Friday Night Live: Live bands are slated to play from 7 to 10 p.m. Fridays in the Veil Pavilion at the Silverton, 3333 Blue Diamond Road. Admission is $5. An after party with DJ R.O.B. is scheduled from 10 p.m. to midnight. Visit silvertoncasino.com. Cardiac support group: The group meets from 11:30 a.m. to 12:30 p.m. the fourth Tuesday of the month in conference room B at Spring Valley Hospital, 5400 S. Rainbow Blvd. RSVP at 702-388-4888. Karaoke Night: The restaurant at Bonnie Springs Ranch, 16395 Bonnie Springs Road, offers karaoke from 6 to 9 p.m. Fridays and live music Saturday nights. Visit bonniesprings.com. Improving improv: Drop-in improv classes with a new instructor every month are scheduled from 12:30 to 2:30 p.m. Saturdays at the Sci Fi Center, 5077 Arville St. Admission is $10. Visit the thescificenter.com. Bluegrass jam sessions: The events are planned at 11:30 p.m. Saturdays on the patio at McMullan’s Irish Pub, 4650 W. Tropicana Ave., Suite 110. Call 702-247-7000. Birds of the Air Food Pantry: The pantry, operating out of Epic Church, 8755 W. Warm Springs Road, is set to provide free groceries to those in need from 10 a.m. to noon the second Saturday of the month. ZIP codes served are 89113, 89118, 89139, 89141, 89148, 89178, and 89179. Email birdsoftheair@epiclv.org. A Home 4 Spot: Pet adoption events are scheduled from 11 am. to 2 p.m. Saturdays and Sundays at Petco, 10000 W. Sahara Ave., from 11 a.m to 2 p.m. the third Saturday of most months at Woof Gang Pet Bakery, 7080 N. Durango Drive, Suite 140, and from 11 a.m. to 2 p.m. the second and fourth Saturday of most months at the Wagging Tail Pet Store, 10170 W. Tropicana Ave., Suite 157. Visit ahome4spot.com. Buddhism 101: The free event is planned at 10 a.m. Saturdays and 6 p.m. Wednesdays at the SGI-Las Vegas Buddhist Center, 2725 W. Charleston Blvd. Participants can learn about Nichiren Buddhism, karma, the Lotus Sutra and how to chant to transform their lives and become happy. Visit sgi-usa-lasvegas.org or call 702-258-6489. Pau Hana Social: The Las Vegas Hawaiian Civic Club conducts a monthly social gathering at the Aloha Kitchen & Bar, 2605 S. Decatur Blvd., No. 110. Potential new members are invited to attend. Visit lasvegashcc.org. Film screenings and live performances: The Sci Fi Center, 5077 Arville St., offers events most Fridays, Saturdays and Sundays. A Typical Saturday Night, an evening of burlesque and comedy, is scheduled at 10 p.m. every third Saturday. Live shadowcast performances of “The Rocky Horror Picture Show” are scheduled at 10 p.m. the second and fourth Saturdays of the month. For a full schedule of upcoming showings, visit thescificenter.com. Toddler fun: Staff members from Family to Family Connection plan to demonstrate activities for toddlers and parents at 11:30 a.m. the first and third Mondays of the month at the Spring Valley Library, 4280 S. Jones Blvd. Visit lvccld.org or call 702-507-3820. Fish feeding: Watch staff members feed the fish in the faux stream at 4 p.m. Fridays at Bass Pro Shops, 8200 Dean Martin Drive. Visit basspro.com. Las Vegas Crafters Guild: The group meets monthly at 7 p.m. on the fourth Thursday at Michaels, 7195 Arroyo Crossing Parkway. Visit lasvegascraftersguild.com or call 702-260-0932. Live music: Music is offered from 7 to 10 p.m. Tuesdays and Saturdays featuring Marty Mancuso and from noon to 3 p.m. Sundays featuring Mark and Dom at Elements Fine Casual Dining & Cocktails, 4950 S. Rainbow Blvd., Suite 100. Call 702-750-2991 or visit elementscasualdining.com. Square Dancing Classes: The Stardusters Square & Round Dancers are set to meet from 6 to 7:30 p.m. Thursdays for $5 at the Meadows Mobile Home Park Clubhouse, 2900 S. Valley View Blvd. Call 702-348-4906. Ethnic Express International Folk Dancing: The Charleston Heights Arts Center, 800 S. Brush St., has scheduled dancing for participants 8 or older from 6:30 to 8:45 p.m. Wednesdays. The cost is $4 per person. Learn international dance styles, including Arabic, Armenian, Bulgarian, Chinese, Greek, Israeli, Macedonian, Russian, Serbian and Turkish folk dances. Call 702-732-4871 or visit ethnicexpresslasvegas.org. Scottish Country Dancing: The Charleston Heights Arts Center, 800 S. Brush St., is set to host dancing for participants 13 or older from 6:30 to 8:45 p.m. Fridays. The cost is $5 per person. Call 702-229-6383 or visit artslasvegas.org. Free Zumba Classes: Licensed instructor Jean Smith teaches dance fitness to Latin rhythms, appropriate for all ages and fitness levels, from 6:30 to 7:30 p.m. Tuesdays at the Windmill Library, 7060 W. Windmill Lane. Call 702-507-6030 or visit lvccld.org. This class is also offered at 6 p.m. Fridays at Body Focus Fitness, 7380 S. Eastern Ave. Call 702-228-4967. Open mic: Events are planned from 8 p.m. to midnight Thursdays at The Orleans, 4500 W. Tropicana Ave. Call 702-365-7111 or visit orleanscasino.com. Live local bands: Bands play at 9 p.m. Saturdays at Money Plays, 4755 W. Flamingo Road, and an open mic night is scheduled at 9 p.m. Thursdays and Fridays. Visit moneyplayslv.com. Lounge offerings: The Gold Coast Showroom Lounge, 4000 W. Flamingo Road, is set to host free shows by DJ Manny at 6 p.m. Thursdays. Karaoke: Music is scheduled from 8 p.m. to midnight Tuesdays and Wednesdays at Jack’s Irish Pub at Palace Station, 2411 W. Sahara Ave. Guests must be 21 or older. Visit palacestation.sclv.com. John Windsor: The singer is scheduled to perform from 8:30 p.m. to 12:30 a.m. Saturdays and 5:30 to 9:30 p.m. Sundays at McMullan’s Irish Pub, 4650 W. Tropicana Ave. He also is scheduled at 8:45 p.m. Mondays at Ri Ra Irish Pub in Mandalay Place, 3930 Las Vegas Blvd. South. Visit john-windsor.com. Jerry Tiffe: The musician is scheduled to perform from 4 to 7 p.m. Fridays at Arizona Charlie’s Decatur, 740 S. Decatur Blvd. Visit arizonacharliesdecatur.com. The Peter Love Trio: The group is scheduled to perform from 9 p.m. to 1 a.m. Fridays at Jack’s Irish Pub at Palace Station, 2411 W. Sahara Ave. Guests must be 21 or older. Visit palacestation.sclv.com.